Dan: Greetings from Jerusalem. This month, I want to take time to share my heart concerning my personal story of how God has provided for our every need during the different seasons in our life. At first, I was always happy that I was not raising funds. I was fully supported for 28 years by our congregation and later the network of congregations that I led. During these two long seasons, I would watch other colleagues who spoke in churches, building mailing lists in order to develop their support base. I thought that this took too much time and energy. I still embrace the desire that congregations would be self-supporting in every culture. This is a goal but not always easy or possible for a season. I did not have sufficient empathy for those who had to raise support. My perspective changed, however, when Hear O Israel,led by Jonathan Bernis, did their amazing music festivals in the Former Soviet Union. Tens of thousands of Jews made professions of faith during those campaigns. Our congregations were called upon to supply people for the congregations that came out of that campaign and for other works in Russia. They would be planters, disciplers and preachers of the Good News. The opportunity, not only for Jewish outreach, but also for reaching gentile Russian speakers, was amazing and wonderful. We sent some 40 people units: some couples, some singles, and some families with children. We gave up the emphasis on our building program and instead raised one and a half million dollars to help support them. One of our couples planted twelve congregations. We changed Tikkun into a sending agency which now had to do so much more than merely supporting Eitan Shishkoff and Asher Intrater in Israel, which had been most of our emphasis before the new season of multiplication. Having the burden to see the support raised for this incredible opportunity connected us to Calvary International in Jacksonville, Florida. Here we learned both their management and funding philosophy. We also read Betty Barnett’s great book Friend Raising. This book became the main textbook of YWAM and over the years they have trained over 30,000 people in how to partner with supporters, connecting them to their ministry. We learned much from them and started to train our own people according to this model and got them into churches and equipped them to share their vision for their work abroad. They were excited to inspire others to join them. It was somewhat of a surprise to find that Patty and I would also need to find support through friend-raising, something that was not in our purview. This was due to our moving to Israel, where we no longer could receive a full salary from our work in the States. Also, the congregations in America and our few in Israel could not provide that support. I had no experience of doing this for our work. Using Betty’s book as our guide, we began building lasting relationships for Tikkun International. Our dear supporters gave to us and to the works connected to us in Israel. However, since we still oversee the congregations in the States, we only need to raise half of our support from outside sources. We started speaking in churches, building a mailing list for prayer and giving, and saw God fully provide for our work in Israel since 2004. Now Tikkun Global (International) has a new important direction and has transitioned to Asher Intrater’s leadership. As you know, we are now released to encourage people to partner with us under the new name of Restoration from Zion while still being fully part of the leadership team that governs Tikkun International. We are always very clear that there are no requirements to be on our mailing list, although we do hope that all our readers will pray for us and our work. But of course, we do provide an opportunity for giving, and we still share funds that are not needed for our support with other ministries. We would like to be able to give even more financial assistance to all the works connected to Tikkun Global, but especially those in Israel. Please pray for us as we continue to strengthen our support base during this season. We are confident, as we join our prayers in agreement with you, that churches we visit will continue to be embracing and generous. We are always desirous of new people connecting with our work and joining us on our journey. We love it when people catch the vision for God’s end-time purposes for Israel and connect with believers in the Land. We are so very pleased by the great responses we have had when we travel to speak in churches about Israel and our life and work. Many of you have signed up to this mailing list as a result of our visits. And to you who pray for us and/or give funds for our support, we are so very grateful. You are part of the great task of our primary work in the Land: mentoring future young leaders (we met with four key potential leadership couples this week), giving input for the strategy of building a stronger network of congregations and works in Israel and, of course, my favorite job: teaching. Your gifts also empower us in working towards bringing together the streams of the Church worldwide and the Messianic Jewish movement in Israel. Many of you give financial gifts regularly each month. These gifts are greatly appreciated and most helpful. If you are not already part of this constituency, would you consider prayerfully becoming one of our regular supporters? 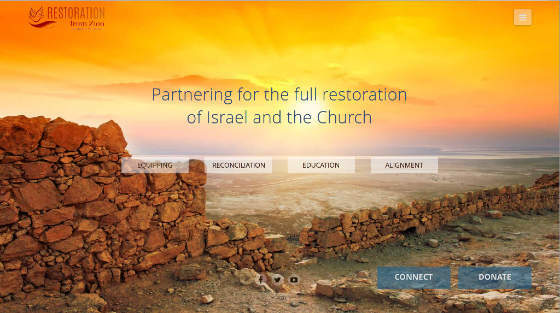 Restoration From Zion is the International apostolic and equipping ministry of Daniel and Patricia Juster based in Jerusalem. The ministry purposes to form solid networks of leaders around the world to partner towards the restoration of five-fold ministry (Eph. 4:11-13), building up the body so that we can all advance the unity of faith for Israel and the Church. Restoration From Zion is a ministry of Tikkun International, a family of several apostolic ministries led by leaders with deep historic covenant relationships and mutual accountability. In addition to many years of fruitful service in the Kingdom of God, the Tikkun International Board of Directors has had years of proven integrity in managing funds together and in each of their respective ministries. This includes audits, disclosure, and low administrative cost percentages that reflect our high standards of efficiency. For more information about Tikkun, please visit www.tikkuninternational.org. Our time will be spent building the Tikkun Israel network of congregations except for a TJCII board meeting, October 15-19 in Jerusalem. I want to encourage all of you who receive our personal letter to sign up for Daniel Juster’s Official Page on Facebook. You will receive many more updates and comments on immediate happenings, both in the news and in ministry. All our books and reviews are also listed on this page. Though I do browse through the comments on this page, there are far too many for personal responses, but I appreciate being able to keep you updated and know of your comments. We want to thank you so much for your consistent support for our transition to Restoration from Zion, our ministry name as we continue to support all the work done in connection with the name Tikkun. With your generous support, we are succeeding! Copyright © 2018 Restoration From Zion, All rights reserved.